Groove, formerly Xbox Music and Zune Music, is Microsoft's premier music service that offers music streaming through subscription or purchase through the Windows Store. Here are some merits and defects you need to know about Groove Music for a better experience with Microsoft’s subscription music service. 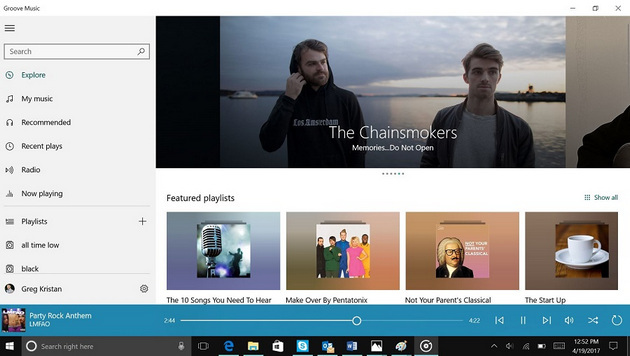 Groove music is the new default music app for Windows 10, while Groove is the Microsoft’s subscription music service. It is also Microsoft's answer to iTunes and comes included with Windows 10. Groove allows you to listen to MP3s hosted in your OneDrive account, and with a monthly subscription, you gain access to millions upon millions of albums from artists both popular and obscure. Xbox One, iPhone and Android users can all get access to their Groove Music subscription away from Microsoft’s platforms. Groove Music has a massive music library with over 40 million songs, more than Spotify, Tidal, Deezer and Google Play Music. Groove apps are available for Windows 10, Xbox, Android, iOS and Windows Phone. if you don’t want to go installing things on someone else’s PC or when you’re away from your PC, there is also a web app that will open all of your music with a simple sign in. Groove doesn't just allow you to stream music from its online catalog; you can also create your own personal cloud locker with OneDrive. Signing up for a Groove Music subscription, you will get 100GB of OneDrive storage absolutely free. By adding your music to OneDrive, you can point the Groove apps to play it on all your devices. One of the most-requested fan features on the Xbox Feedback site has been the addition of background music. Since last update, now users can hop right back into your game and continue to play with the Groove Music in the background. The Groove Music Pass offers unlimited on demand music and artist based radio stations with unlimited skips, no advertisements, and offline playback. 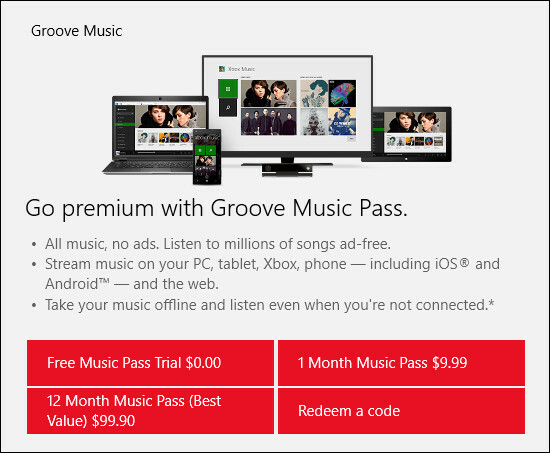 A one month Groove Music Pass is $9.99 and (a better deal) a 12 month pass is $99.90. 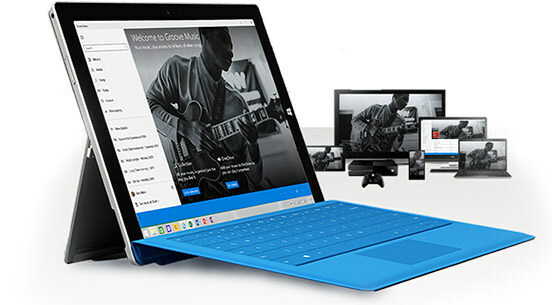 With a Groove Music Pass, you get access to Microsoft's catalog of online music to stream or download for offline use. You also need to remember that you can only have offline music on a total of five devices at any one time. An advertising-supported streaming tier was previously available, but discontinued effective December 1, 2014. You just load content stored on OneDrive if there’s no pass to stream with. Music is reported to be streamed at 192kbps WMA which is lower than most comparable streaming services. While the music is downloaded at 256kbps WMA, there may be an improvement but still lower than Google Play Music and Spotify. It lacks extra features such as parental controls, viewing the lyrics while music is playing and even gapless playback so you can listen to albums that were designed to be one continuous mix. Groove Music Pass is a subscription-based service allowing unlimited streaming of the service's catalog. Since Groove is cross-platform, once you've subscribed you can listen to subscription music on any device with the Groove Music installed. So long as you keep paying for it you can keep playing the music without buying each song or album. The pricing in US includes monthly and annual subscriptions: $9.99 per month, $99.90 per year. What if you already have an Xbox Music Pass? Never mind, the changes are in the branding as Microsoft feels that having Xbox in the name is confusing to some. But if you're already a subscriber nothing will change for you. Just load up the new apps as and when they appear and continue to enjoy your tunes! Groove apps are available for Windows 8, Windows 8.1, Windows 10, Windows Phone, Xbox 360, Xbox One, Android and iOS. A web-based version is also available. Microsoft Groove is an online music streaming service similar to iTunes, Pandora, Spotify and others. This service is ideal if you want all your music in one place, as well as access to millions of new and old hits. Microsoft's Groove Music offers a great choice in curated mixes for every conceivable mood or activity, while you can still create your own too. However, it is also a fairly basic service. Because it doesn't have a free plan like Spotify and option for gapless playback, streaming in different qualities or displaying lyrics while listening to music. If these are important to you, it may not be the streaming service to pick. Apple Music is the new member of pop music, but also one of most popular music streaming service undoubtedly. For Apple Music subscribers, DRM restriction is always the biggest barrier that prevents them from streaming Apple Music songs one more devices, like Windows Phone, Android tablets, or car stereo. Do you want to convert Apple Music to DRM-free MP3 format? Well, you are in luck, as thanks to the NoteBurner Apple Music Converter that is specially designed for Apple Music users. 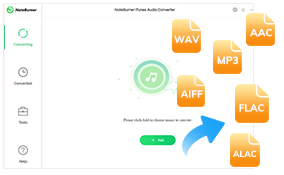 The program is a pretty practical DRM removal to remove DRM from Apple Music songs and playlists and convert Apple Music files, audiobooks, or other downloaded music from iTunes or Apple Music to MP3, FLAC, AAC or WAV format. And it is capable of converting any Apple Music files, iTunes audio file at 20x faster speeds with keeping lossless audio quality.